The Academic WorldQuest Competition is an exciting global trivia competition for high school students. 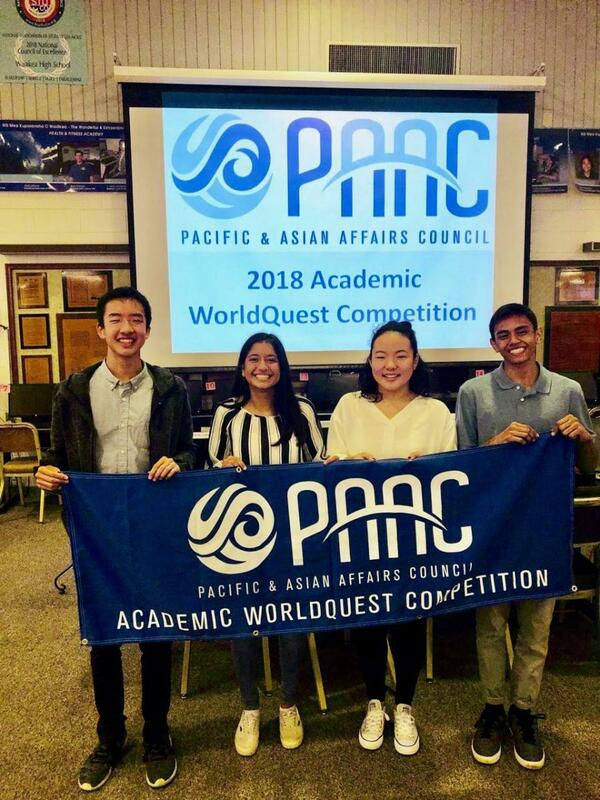 Students, in teams of four, test their International IQ and the winning team wins a trip to Washington, D.C. to compete in the National Academic WorldQuest Competition. The Hawaiʻi competition and grand prize is generously sponsored by the Mamoru and Aiko Takitani Foundation. Academic WorldQuest is a flagship program of the World Affairs Councils of America, a network of over 100 councils that engages more than 4,000 high school students annually across the U.S. to test their knowledge of global issues and foreign policy. The 2018 Academic WorldQuest Competition was held on December 1, 2018 at UH Campus Center Ballroom, Maui High, Kealakehe High, and Waiakea High. The 2018 categories were: Current Events, North Korea, Space Policy, the Global Migration and Refugee Crisis, Japan-U.S. Relations, and the World Trade Organization. A study guide was provided with the competition format and detailed resources on each of the categories to help students and teachers to prepare for the competition.